Guggenheim Museum Bilbao is a museum of modern and contemporary art located in Bilbao, Basque Country, Spain. The museum complex, designed by Frank O. Gehry, consists of interconnected buildings whose extraordinary free-form titanium-sheathed mass suggests a gigantic work of abstract sculpture. The museum was inaugurated on October 18, 1997, by former King Juan Carlos I of Spain. 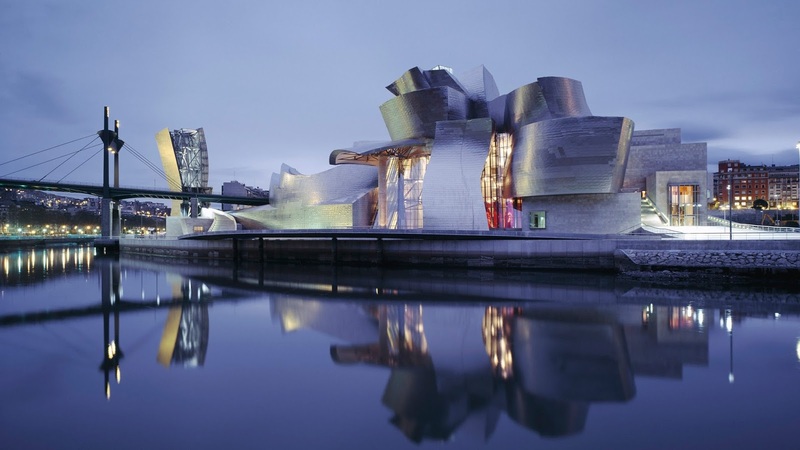 Built alongside the Nervion River, which runs through the city of Bilbao to the Cantabrian Sea, it is one of several museums belonging to the Solomon R. Guggenheim Foundation. It is one of the largest museums in Spain. The museum has a total of 24,000 square meters (260,000 square feet), of which 11,000 square meters (120,000 square feet) are dedicated to exhibition space. Because of their mathematical complexity, the sinuous curves were designed using a three dimensional design software called Catia, which allowed designs and calculations that, years earlier, had not been possible. There is approximately 33,000 extremely thin titanium sheets provides a rough and organic effect, adding to the material’s color changes depending on the weather and light conditions. The other two materials used in the building, limestone and glass, harmonize perfectly, achieving an architectural design with a great visual impact that has now become a real icon of the city throughout the world. Under the chaotic appearance created by the opposition of fragmented regular forms with covered stone, curved forms coated in titanium and large glass walls, the building is built around a central axis; the hall, 50 meters (164 feet) high, a monumental empty space topped by a metal dome. Around it, a system of curved bridges, glass elevators and stair towers connecting the 19 galleries spread over three floors, which combine classic rectangular space with other unique forms and proportions, all lit by the dome zenith. There are two sculptures outside the museum: Puppy and Maman. 12 meters (39 feet) high floral puppy which was designed by the American artist Jeff Koons.This puppy has a coat with colored flowers and forms. 10 meters (33 feet) tall spider, Maman is a bronze, stainless steel, and marble sculpture by the artist Louise Bourgeois. Since its public opening, the Bilbao has acquired a permanent collection that spans the middle of the 20th century to contemporary time.The emphasis is on European and American painting and sculpture from the post-war period. There are works of many genres including Minimalism, Pop Art, Conceptual Art and Abstract Expressionism. Noteworthy artists represented by the collection include Willem de Kooning, James Rosenquist, Cy Twombly and Andy Warhol. The collection also features Spanish and Basque regional artists including Cristina Iglesias and Eduardo Chillida. The opening of the museum provided a boost for tourism. Thousands of visitors come to Bilbao every year just to see the museum. Although the metallic form of the exterior looks almost floral from above‭, ‬from the ground the building more closely resembles a boat‭, ‬evoking the past industrial life of the port of Bilbao‭. The building was constructed on time and budget, which is rare for architecture of this type. Before choosing titanium, 29 different materials including stainless steel, copper and aluminum were considered. The museum’s location is quite noisy and because of that the glass used in the windows had to be special.The windows used are called “Natural 62” and were supplied by Idom.